Satguru Shri Mahayogi Paramahansa will visit New York this summer 2018!!! There is no opportunity more precious than to experience the teaching of Truth from a living Master. Shri Mahayogi graciously guides each and every seeker according to their individual need from his own direct experience of the Eternal Truth. From unveiling the innermost workings of the mind and subtlest realms of meditation to demystifying the concept of God and revealing the essence of all religions, Shri Mahayogi pours pure and compassion-filled teachings indiscriminately into the hearts of all. This summer, learn, study and experience the universal teachings of the Truth for yourself!! Programs, including practice of Asana and Meditation directed by Shri Mahayogi (Sundays 7-9 pm), will begin June 17th and continue through September 9th. Registration available Sunday May 20th online through Eventbrite or in class. Hunger for the Truth along with simple and sincere practice most assuredly advance the true seeker on the path of Yoga!!! In this month’s issue of Pranavadipa (Vol. 42), from the Satsangha through to the Testimony, the concretization of this is woven like a thread throughout. 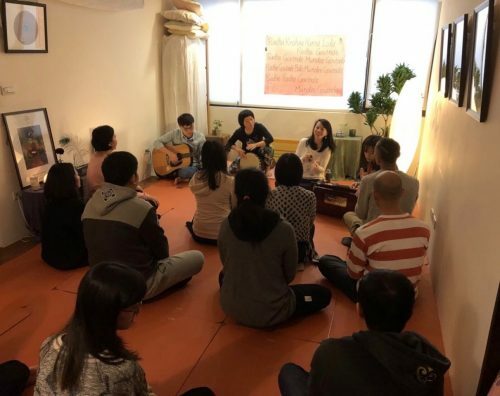 The Satsangha is the fourth of four special Satsangha that took place in Taiwan in May of 2017, when Shri Mahayogi first visited Taiwan at the invitation of Prasadini (the leader of the sangha in Taiwan) and other practitioners who had been gathering together to regularly practice asana and meditation, and to study the teachings of Shri Mahayogi and the teachings of Yoga. This particular Satsangha is filled with the crisp and powerful teaching of Shri Mahayogi as he generously offers guidance on establishing yama and niyama (the precepts of Yoga), eliminating sanskara, the applications of meditation, the meaning of Jesus’ teaching from the Bible, and as he dispels, with utmost grace and compassion, the doubts of a mother who is most concerned about her daughter’s choice to follow the path of Yoga. This is the same daughter who asked Shri Mahayogi just one month prior when she first met with Shri Mahayogi during a visit to Kyoto, about how to view familial relationships from the point of view of Yoga (Pranavadipa Vol. 33). 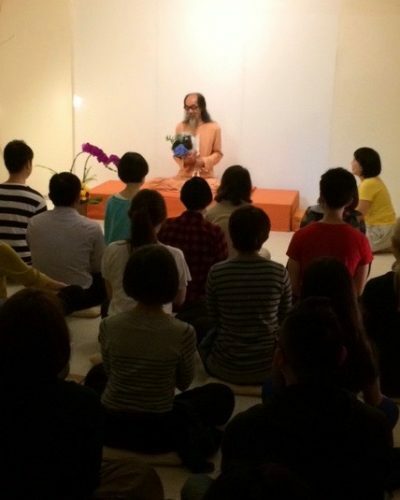 Since Shri Mahayogi’s first visit to Taiwan, he has returned two more times within the year. The group of practitioners in Taiwan was started by Prasadini, whose Testimony is in Pranavadipa Vol. 34. When Prasadini was first in New York, she mentioned that the only person she knew who would be truly interested to meet Shri Mahayogi was her cousin. Indeed, as she guessed, Prasadini’s cousin, Priya, whose Testimony is in Pranavadipa Vol. 33 & 37, was also gradually drawn to Shri Mahayogi and the Mission. Now she serves as a translator of Chinese and Japanese when Shri Mahayogi visits Taiwan. 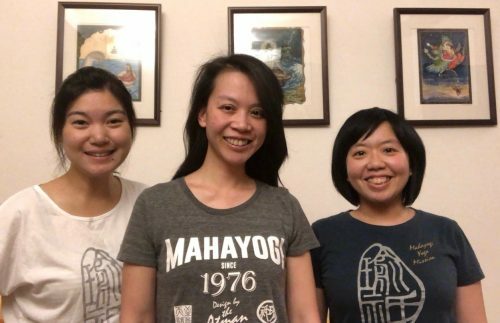 After Priya, two more practitioners joined the sangha, and now they have more than 10 staff members who have been dedicating themselves to inviting Shri Mahayogi and participating the work of the sangha in Taiwan. In preparation for Shri Mahayogi’s third visit to Taiwan, Anandamali (director of the New York Mahayogi Yoga Mission) arrived one night beforehand in order to join His stay. The first night she stayed at the house where Prasadini, Priya and Lilly live together in an apartment in the central area of Taipei. Radha and Marula, who are two of the central staff members also stayed there that night. The next morning, before Radha went to the flower market to prepare the flowers for Shri Mahayogi’s visit, there was a moment when she was alone with Anandamali, sitting in front of her. Then Radha spontaneously and straightforwardly spoke about how much she anticipates the 8th of every month so that she can read the new issue of Pranavadipa, which she always reads beginning with the Testimony, since it is easier to relate to and therefore understand. Because the teachings are in a more relatable format, she first learns from them that way, then moves on to the Satsangha, which she reads and studies again and again. It was a quiet moment, and her sincerity was moving. After that, suddenly her face flushed with redness and tears came streaming down her cheeks as she said, “My thoughts and actions still do not match.” It is obvious that she keeps thinking about the Truth, the teaching of Yoga, and of course, our beloved Shri Mahayogi… Unless we keep thinking about the teachings constantly such words and emotion cannot appear. Indeed, it was a great moment to tangibly witness how a disciple and how sangha are working in Taipei. 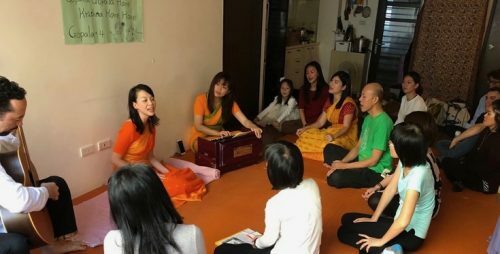 What’s more, many of Taiwan staff members commented that the Satsangha that took place during Shri Mahayogi’s third visit to Taiwan went much deeper than the first two. Of course, the more we deepen our practice, the more we can receive answers that delve further and further into the Truth. They were amazed, again, by the Master, Shri Mahayogi. year since that first visit. From these messages and their experiences shared within, it is tangibly revealed that it is out of practice and sincerely yearning to understand the teaching that one is led to concrete growth along the path of Yoga. The heartfelt sincerity and yearning for real practice that drives the steps of the seeker to walk along the path of Yoga have the power to inspire us all in our own journey and propel us forward. May we feel the inspiration of our Taiwan brother and sister gurubhai!! Indeed, the rapid development in Taiwan of passion for Yoga and for the teachings of Shri Mahayogi is really quite remarkable. Prasadini first met Shri Mahayogi when she was visiting New York in 2013. That first meeting left her questioning what she had come to understand about Yoga up until that point. 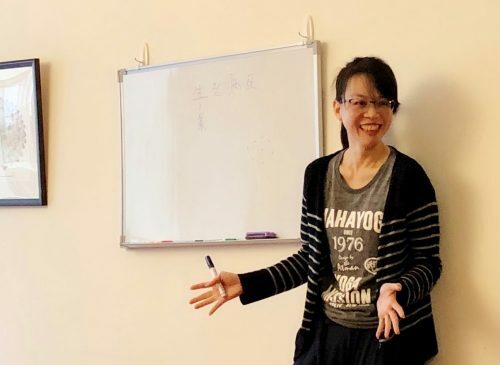 After she returned to Taiwan, she traveled to Kyoto to meet Shri Mahayogi and the sangha in Kyoto, and it was then that she gave up the idea of trying to stay in New York, and instead decided to remain in Taipei. 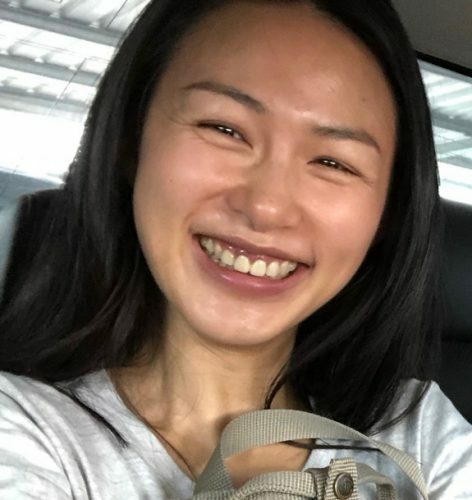 Little by little, she continued to practice what she had learned from Shri Mahayogi, all the while gathering the people alongside her to practice together with the hope of inviting Shri Mahayogi to Taiwan one day. As time went on, she would come to question what would be a truly worthy cause for her to dedicate her life to, and in the end her passion toward the Truth became the center of her dedication. Here we would like to share an article written by Prasadini that relates her experience of meeting her Master and transforming her life to truly dedicate to Yoga. But first, we would like to announce some GREAT NEWS. The other day Shri Mahayogi bestowed a name upon the apartment where Prasadini lives alongside two other disciples. From now on, it will be called Ananda Ashrama!!! Namo Maha Prabho Namo Mahayogin te Om………………………………………..
Beloved Master, may we express or deepest gratitude for your grace and blessings that shine infinitely upon us, filling us with the light of Truth. May this new Ashram be the gem of true Yoga in Taiwan and may that light of your Truth shine forth through our everyday actions. Kirtan practice at the place that is now called Ananda Ashrama. 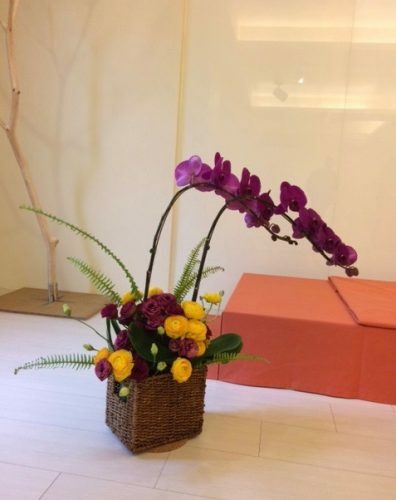 The following is an essay by Prasdini who lives in Taiwan and has been striving to practice and participate in the activities of Yoga. It recounts her meeting with her Master in New York, as well as the trials and tribulations in life while progressing on the path of Truth. For seven years during the time before I met Shri Mahayogi, I was travelling to many countries, participating in various yoga retreats and teacher trainings. I don’t know what I was seeking, but I felt that I was able to get away from my busy life for some time and get closer to the teachings of Yoga, so I was always planning the next trip. However, every time a “fantastic” yoga vacation ended, I had to go back to a crazy, packed schedule in order to earn and save enough to go on the next trip. Looking back now, it was as if I was a hamster, blindly continuing to run inside the wheel without any purpose. I learned many teachings of Yoga from yoga classes and from scriptures, yet nevertheless I could not put an end to the confusion in my own life, and I couldn’t see the contradictions between my thoughts and my actions. What is most frightening about this was that I thought that this kind of life was normal. In 2013, I spent an unforgettable summer and autumn in New York. The friend whom I was staying with was a disciple of Shri Mahayogi, and he kept talking about love for the Guru (Master) all throughout our conversations. These conversations reminded me of a book, Autobiography of a Yogi, which had been a big influence on me. I wanted to improve my English because I wanted to learn more about Yoga, so in 2008 I went to England and stayed there for a few months. At that time, the book, Autobiography of a Yogi, always supported my soul, which continued its wish to search further into the spiritual realm. Yogananda was seeking his Guru since childhood, and always praying in his heart and crying out for it. I sympathized with Yogananda’s prayers. When I asked myself, “Will I ever be able to meet my Guru in this lifetime?” and meditated, tears flowed uncontrollably. Afterwards, my yearning for a Guru was swallowed up by various other activities. I even thought that such a pure relationship between Guru and disciple might no longer exist in modern society. However, when I was allowed for the first time to attend the Satsangha at the Cave (the name of the space where the Mission in New York is based,) and from seeing the exchange of gazes between Shri Mahayogi and his disciples, I felt very much the deep love and trust between them. It reawakened my thirst for finding my Guru. Yet, at the time, I was not sure whether Shri Mahayogi was my Guru or not, and I thought that I had to carefully think about this. In one Satsangha I asked him, “What is the Truth?” and “What is the relationship between Guru and disciple?” Shri Mahayogi answered me with a compassion-filled gaze and in an unshakable tone. His words were very difficult for me to comprehend at that time, as if he were speaking in an alien language, but I was so drawn to his pure smile. Such affection brought me joy and I felt my consciousness expand. “Student: How does one increase one’s passion to know the true Self? I looked at the flyer for a long time, but I could not answer these questions. Yet, at the same time, the world and the values I used to believe in began to crumble. This transformation was tangibly felt the year after, in 2014 when I visited Kyoto. It was cold in March, and at the home of my fellow gurubhai (brother and sister disciples), for the first time I got involved in the task of cleaning the bathroom, for the first time I got involved in helping out with the preparation of meals, and for the first time I heard the senior disciples’ life stories, the challenges they faced and the faith they had on the path of Yoga—I was deeply moved seeing the way in which they lived their lives so seriously. Nevertheless, I could not understand in the least how they were able to take that first step towards staking their lives on the path of the Truth. So in Satsangha, I asked Shri Mahayogi this question, “Eventually, everything in the world repeats the cycle of life and death, so the world will vanish one day and then will be born again. If that’s the case, what is the meaning of the existence of this world?” Shri Mahayogi answered that “It exists in order to serve all people in realizing that everything in this world is a dream, and for people to wake up from the dream and serve others.” His words resounded in my heart. He gently smiled and looked into my soul deeply with an unshakeable gaze. Indeed, the past troubles, pleasures, pains, times of happiness, they were all like a dream. Everyone (including myself) is working hard, spending their entire lives chasing after a dreamy success. When I thought about that, I was overcome with a sense of emptiness, that everything in the end will vanish. If both are required to make efforts as much to stake my life on it either way, then I thought, wouldn’t it be more worthy of the effort, to realize the Eternal, Unchangeable true Self? Such thoughts began to grow quietly in my mind. I would like to express my gratitude towards the senior disciples who always helped as much as they possibly could while I stayed in Kyoto. The friendship especially from Anandamali-san, Takashi-san (Ramdas), and Yohei-san (Gopala), nurtured my yearning towards the true Self. The senior disciples’ demonstrations of walking on the path of Yoga always encouraged me. Buddha said, “My disciples are not the ones who merely see my flesh, but the ones who know my teachings.” But then, how do we actually apply the practice into our action? As I saw the disciples in Kyoto and New York always spend time together, live and practice together, I recognized the importance of sangha (like-minded peers). Sangha not only encourages and enlightens one another, but at times, can clash and break apart the ego to eliminate it. I felt the necessity for sangha in Taiwan too. But then I thought, “Will I be able to transmit Shri Mahayogi’s teachings to people in Taiwan, and create and establish a sangha little by little? I am so grateful that Shri Mahayogi blessed this thought, and told me that he is always with me. 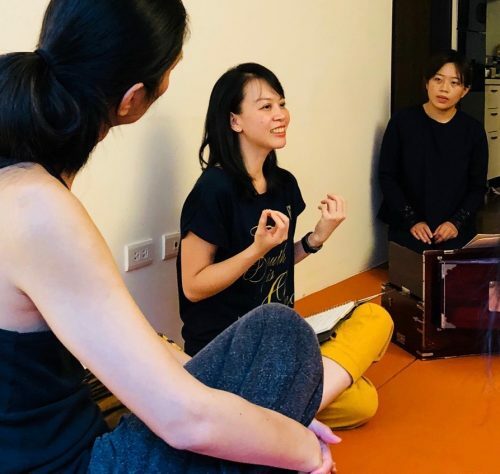 The words of Shri Mahayogi gave me courage and power, and I began to lead asana and meditation classes once a week when I returned to Taiwan. Nonetheless, things don’t go that easily. Shri Mahayogi told us that the visible sanskara (potential impressions from past experiences) are like the tip of an iceberg. As soon as I went back to Taiwan, the stubborn desire and ego appeared, and I was tested in my determination. I had an offer from another place to teach Yoga abroad. Then I’m afraid I thought that I could perhaps take this job for a year or two, teaching Yoga in Beijing and India, and then afterwards I could begin applying Shri Mahayogi’s teachings into practice seriously. 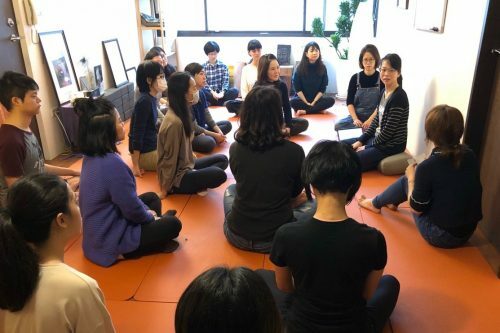 Even so, I felt—“I can’t bring myself to teach the methods I don’t believe in anymore, nor can I disseminate the teachings of Yoga which my heart can’t even actually put into action for myself!” “Can I really teach the Yoga of Truth?” In my second visit to Kyoto, I received the answer to that. A student asked me after class, “Lynn,* I know that you have studied Yoga for a long time, and sought and met many yoga teachers. But why did you choose this current teacher?” Well, why did I choose Shri Mahayogi? While I stayed in New York, I often heard in Satsangha, “Put the Truth into actual practice.” A senior disciple who has studied under Shri Mahaoygi for 15 years told me, “For the past 15 years, the teachings that I have received from Shri Mahayogi are always simple, and the Guru always encouraged us to put them into action.” There is no one but a Guru who is truly in the state of Truth that can demand that disciples practice the Truth! There are many teachers in this world who teach only through words, but there is no one else but the only Existence who can truly guide students towards that true Existence! * Prasadini’s birth name. She received the spiritual name, Prasadini, by Shri Mahayogi in 2017. That thought was verified in a Satsangha when I went to Kyoto for the second time. At that time, Shri Mahayogi answered to Takashi-san (Ramdas), “At first, you seek to attain the state of Bliss, but afterwards, you become Bliss itself,” and then looked at me with a smile. In that gaze, I felt a Pure Existence. Shri Mahaoygi was permeated with Joy, and I sensed that Shri Mahayogi himself is none other than Joy itself. I laughed and tears came out of my eyes. I found out that that was darshan (the divine gaze) from a Guru. I felt that the darshan I received from Shri Mahayogi filled me with uncontainable blessings and love. In that moment, it became clear to me. I cannot teach Yoga. Going abroad for a year will only fill my ego, and all the efforts I would make for that will vanish like a dream once again—it will be nothing but a waste of time. If I would continue with these plans exactly as they were, then I would ultimately be defeated by the fraud and emptiness within them. No matter what words I use, I cannot express the gratitude I have towards Shri Mahayogi. After returning to Taiwan from Kyoto, we have worked hard proactively and made efforts to grow the sangha in Taiwan. Even if we cannot do everything right from the beginning, I believe that the secret is within action. We have two Asana & Meditation classes per week, once a month we have a reading group, and we also have other occasional gatherings. Every action is for seeking the Truth, and sangha and these activities give meaning to my life. I could not recognize my Guru at first glance like Yogananda could, but the sincere, earnest exchange between Guru and disciple is beginning to arise within me. I have come to know that I am receiving Shri Mahayogi’s love and guidance. More importantly, I felt the blessing of God. And that blessing is not only given to me, I felt clearly that it is to the sangha in Taiwan! I will continue to cherish and nurture that sangha from now on, and tirelessly put the teachings of Shri Mahayogi into action. Taiwan Sangha in Kyoto 2017. On the way to attend Shri Mahayogi’s Jayanti!!! 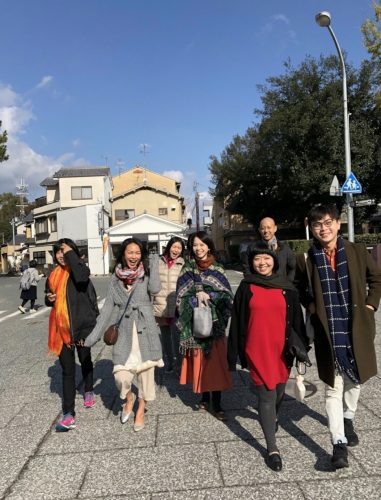 9 members from Taiwan visited Shri Mahayogi and Sangha in Kyoto, Japan. 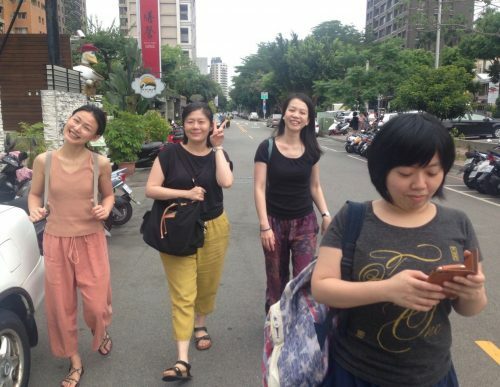 And here are the three ladies who now live in Ananda Ashrama, Taipei! Pranam to our Most Beloved Shri Mahayogi.